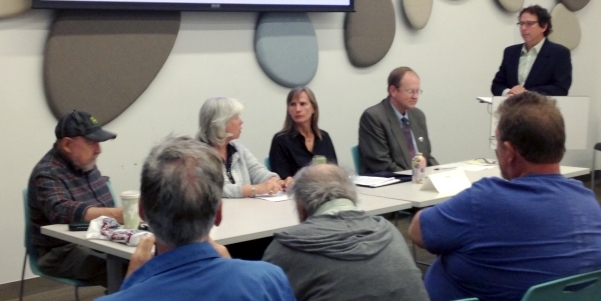 At a PLAN-Boulder County election forum for Boulder County Commissioner candidates on September 30, 2016, Republican challengers clashed with Democratic incumbents most starkly on the subjects of roads and buses, the Twin Lakes low-income housing project proposed by the Boulder County Housing Authority on unincorporated land, affordable housing in general, and the overall management of the Boulder County government. In District 1, Democratic incumbent Elise Jones is being challenged by Republican Kevin Sipple, one of the founders of the Eldorado Springs Water Company; while in District 2 Democratic incumbent Deb Gardner is trying to fend off an election bid by Republican Paul Danish, a former Democrat who has served as both County Commissioner and Boulder City Council member in the past. Danish and Sipple both declared that they would re-allocate existing county funds to maintain and re-build roads that the county accepted in subdivisions in unincorporated areas during the late 20th century. “It [the county] should quit trying to welsh on the deal and do the work. It should quit trying to pretend that it doesn’t have the money,” Danish exclaimed. Gardner claimed that funds which might otherwise be spent on road re-construction were needed for flood recovery efforts and other programs. Jones contended that Danish and the other County Commissioners in 1995 had “kicked the can down the road” by accepting the subdivision roads but not identifying a source of money for their eventual rehabilitation. Jones asserted that both the current commissioners and many residents of unincorporated Boulder County believe that Ballot Issue 1A, which would increase property taxes modestly to pay for subdivision road reconstruction, is a reasonable way to resolve the impasse. In more general terms, Danish called for robust maintenance and perhaps expansion of existing arterial roads to accommodate the increased population of the county, which, he implied, depends and will depend on cars for transportation. Sipple categorized good roads as a basic county service that it should emphasize instead of, for instance, efforts to reduce climate change, which both Jones and Gardner listed as top county priorities. Danish attacked the concept of implementing a county-wide Eco Pass as unappealing to most of the public. He remarked that there are 200,000 cars in Boulder County. “People have voted with their wheels in terms of how they get around,” he claimed. He contended that subsidizing rides for people on Uber and Lyft would “provide more bang for the buck” than a county-wide Eco-Pass. Sipple said he would support a county-wide EcoPass, but only if riders with the means to paid some or all of the cost of their trips. Gardner and Jones both lauded the idea of a county-wide Eco-Pass. “It will revolutionize how we travel in our county,” Jones exclaimed. Gardner asserted that people with an Eco-Pass are nine times more likely to ride a bus than those without one. However, both Gardner and Jones admitted that financing of a county-wide Eco-Pass would be difficult, and Jones acknowledged that recent polling of county residents did not show enough support to put a funding measure on the ballot this year. “It would be hard to imagine a worse place to build a public housing project. It should be junked immediately,” Danish fulminated. Sipple maintained that the site is “virtually a swamp” and that the closest bus stop is ¾ of a mile distant. He proposed that low-income housing be built instead in the Gunbarrel business center, which enjoys many more municipal services, including bus transit. Jones claimed that the Boulder County Housing Authority, which has championed the project (and which the County Commissioners chair), has pledged not to build more than 12 dwelling units per acre at Twin Lakes. She also contended that it has agreed to create wildlife corridors, Open Space buffers, and other environmentally-friendly features. She and Gardner said that the Twin Lakes development would resemble several attractive projects which the County Housing Authority has recently completed or started elsewhere, although they admitted that those other complexes are located in incorporated municipalities. While acknowledging that affordable housing seems to be in short supply throughout the northern Front Range, Danish observed that the scarcity is particularly acute in Boulder County, because we have largely succeeded in protecting the environment. “As a result a lot of people want to live here,” he said. He contended that there is nothing that Boulder County could do to significantly relieve the affordable housing crunch, short of abandoning the Open Space program, as well as various environmental protections—which, he said, he is unwilling to do. “All it can do is nibble around the edges,” he stated. Gardner and Jones seemed to believe that the County Housing Authority’s projects are doing more than just “nibbling around the edges.” They decried a recent study claiming that 40,000 Boulder County residents spend more than half of their income on housing and spoke glowingly of the work of two of the county’s departments to prevent and reduce poverty. Gardner opined that a regional solution is needed for the affordable housing crisis and also advocated more land-banking. Jones commented that preservation of existing affordable housing should be given serious consideration. Both incumbents seemed receptive to the suggestion that the county might require the majority of units in new developments to be permanently affordable for low or moderate income residents, while Sipple called that idea “ridiculous.” Danish cautioned that permanently affordable housing can be hard to sell and may unwisely limit their owners’ ability to accumulate equity. Sipple vehemently denounced the county’s land use department. It has become “very arrogant and abusive to private citizens,” he charged. He claimed that the land use department maintains a waiting list of people to be placed on its waiting list and that the county’s review of proposed construction projects usually takes six months or more. Danish decried what he called the county’s “won’t do, don’t do, can’t do” attitude. He accused the current commissioners of ‘kicking the can down the road.’ Both he and Sipple cited the tripling of the county’s budget in the last 20 years as evidence that it is poorly managed. Danish called for the implementation of the “Six Sigma” and/or “Lean Process” management techniques as the way to control spending and promote efficiency. the budgeting process. “No one shows up at budget hearings,” Jones observed. Gardner and Jones both expressed hope that a new county website will provide much better information to the public about the county’s finances. Next Topic: Is City of Boulder Ballot Issue 302 Necessary? Would It Cause More Harm Than Good?